An unbelievable view of historic Buffalo Trace and the Kentucky River with over 4 acres in Franklin County, a five minute drive from downtown is this once in a lifetime house with views of the Kentucky River and bluffs below. 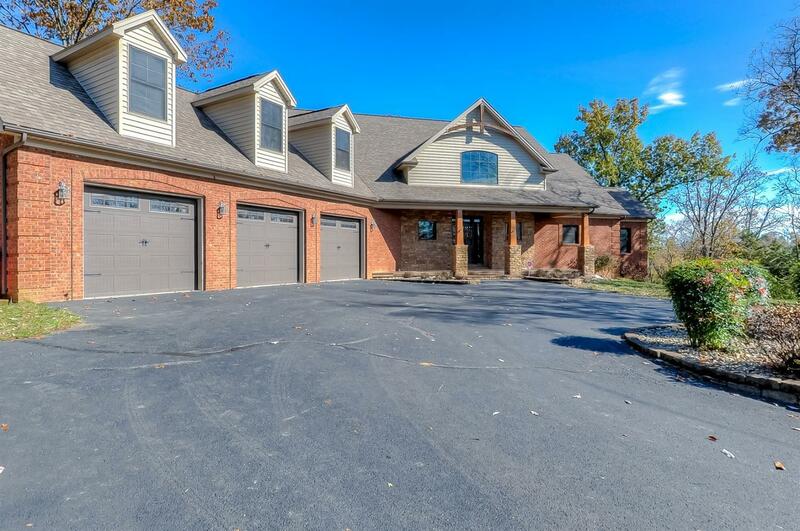 4 bedrooms and 4.5 baths and an open floor plan on three levels. The living room is vaulted and expansive and an abundance of natural light enters from oversized windows through which the valley opens. The kitchen is adjacent to the living room with brand-new appliances and granite tops. Several seating areas surround the kitchen to allow comfortable hosting of large groups on the first floor. The basement below with open rec room and custom-designed wet bar allow a second gathering area. More bedrooms are upstairs for the kids or for accommodating guests. The outside area with patios, decks, fire pit and circular drive give room to host any number of people and the relaxing setting perfect for taking it easy too. Don't forget the three car garage!